what happens to you while you are making other plans. 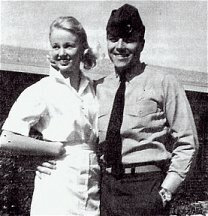 Daughter Joanne attended a girls' school in San Marino before moving back to graduate from Van Nuys high school and got a job as a private secretary at the North American Defense plant in Canoga Park. 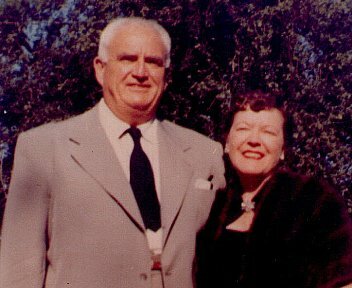 She married her boss, Charles Anselmo, Jr., and they had four daughters. 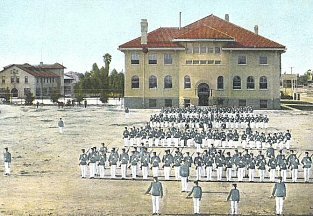 Mike went to Harvard Military Academy in Studio City where he graduated with honours and went on to attend Arizona State University, Colorado College and the Naval Aviation program at Pensacola, Florida. He played on the football and basketball teams and was a champion swimmer and diver. 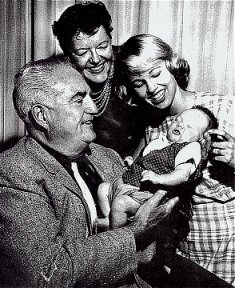 He married Jan Watts of Whittier, California after graduation and they had a son, James Christian Pierce, on August 26, 1961, followed by two daughters: Brooke and Courtney. 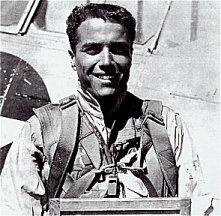 Mike had often flown with his father in the aircraft that Jim had used for his real estate dealings and obviously inherited his father's love of flying as he became a decorated Marine pilot in Viet Nam. Joan, Jim and Jan had the chance of joining Michael in Tokyo during a "rest and recreation" session where they mixed business with pleasure by calling on a publisher regarding the sale of Tarzan books in Japan. 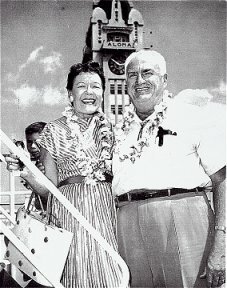 Jim retired in 1964 but Joan was still very involved with ERB, Inc. as she and her brothers were all on the Board of Directors. In her role as Secretary-Treasurer she had to be within a reasonable distance for board meetings so they chose a home in nearby Apple Valley. Since golf had developed into a consuming passion for the couple they built a home on the edge of the Apple Valley Golf Course. It was a quite an impressive structure with guest quarters, pool, and bath house with sauna. The years following their retirement brought a steady run of career tributes for the Pierces. 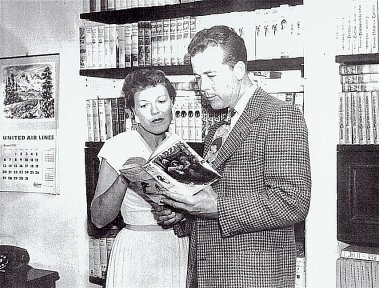 They were guests of honour at the Labour Day Dum-Dum Convention in Chicago in 1965 where they were presented with a silver trophy, engraved "James H. Pierce and Joan Burroughs Pierce, Guests of Honor, the Burroughs Bibliophiles, September 5, 1965." In 1966, as part of a publicity stunt to promote the weekly NBC Ron Ely Tarzan television series, the Pierces were invited to Mexico City where the series was being filmed. The aim was to get a group of living Tarzans together for a banquet and photo shoot. The Tarzans who showed up were Jim, Johnny Weissmuller, Jock Mahoney, and Ron Ely. 1967 brought another major event to which the Pierces were invited. Bloomington was acknowledging the 50th anniversary for all athletes who made their letter "I" in any sport in 1917 and Jim was one of those so honoured. 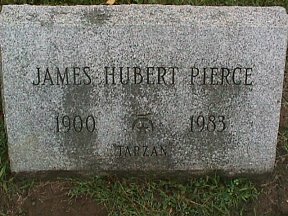 Tarzan of the Apes is an important member of the Burroughs family. In addition to growing up on the Tarzan novels written by my dad, Edgar Rice Burroughs, we have been very close to the Tarzan movies. I, personally, can vouch for our involvement in films because I married Jim Pierce, the lead in the last silent Tarzan feature picture, TARZAN AND THE GOLDEN LION, in 1928. 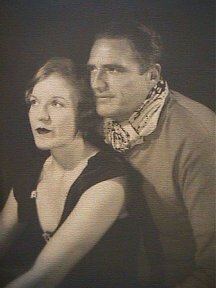 He, as Tarzan, and I, as Jane, also made the first radio serialization of dad's books in the early 1930s. This series authentically followed his writings. My father was never able to understand why the Tarzan motion pictures would not follow his stories more closely. He wrote such a fantastic wealth of material and it seemed to him that some of it should have been suitable for the screen. Instead, Hollywood writers changed the stories and created their own version of dad's hero. For years he tried in vain to get film producers to maintain an integrity with his work. Finally, he gave up, frustrated, and let them do what they were going to do anyway. 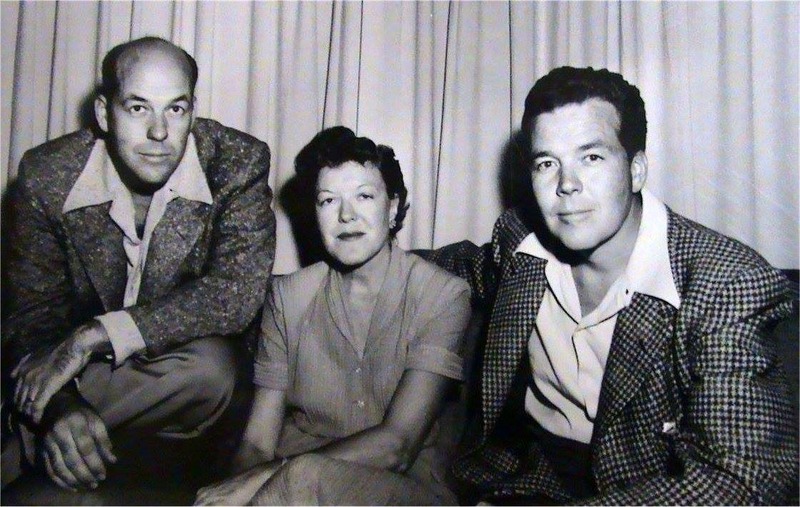 It is the hope of ERB, Incorporated, and the entire family that someday we will eventually see films produced from the Tarzan books as they were written. If by no other means possible, we may even produce the films ourselves. 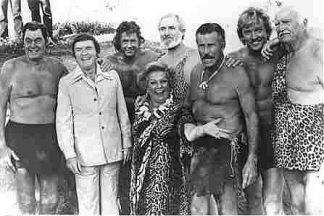 Another Tarzan reunion took place on March 2, 1971 on the Merv Griffin Show. Jim, Mahoney, Ely and Buster Crabbe were present for this one. Then Joan appeared as a guest on Garry Moore's "To Tell The Truth" show in New York. A last-minute choice for the person to introduce her was husband, Jim. The experience was a thrill for Joan who hadn't been to New York since she was ten. They stayed in the Waldorf-Astoria Hotel and were given the royal treatment by everyone connected with the show. The "Burroughs Boom" of the '60s had given birth to a whole new crop of fans for the works of Edgar Rice Burroughs and the worlds and characters he had created. Thanks to the advance of modern technology, a revival in publishing out-of-print editions and the spread of fanzines, these new fans were even starting to discover the decades-old radio series in which the Pierces had starred. 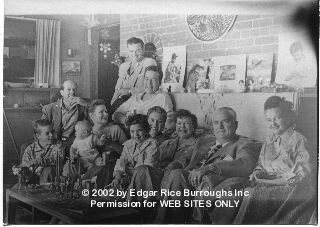 Fans from all over the world were making pilgrimages to the '20s-style bungalow that had served as the ERB, Inc. offices since the company's formation. One such visit, involving the author of this tribute during the summer of 1971, is described in ERBzine 0192 and ERBzine 0193. 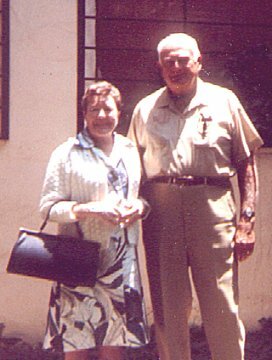 We had a wonderful visit with Joan and Jim one morning, thanks to the hospitality of Hulbert Burroughs, who had suggested that we spend an extra day in Tarzana so that he could set up a meeting between us. 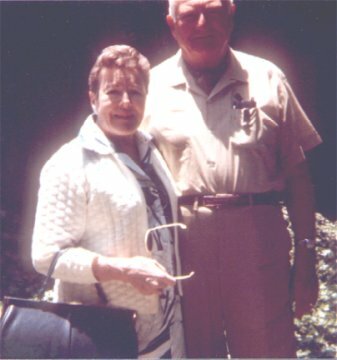 Although they were experiencing health problems, Jim and Joan were warm and gracious people. Joan had recently gone through cancer treatments and a mastectomy operation and Jim was recovering from a serious heart attack but they carried themselves with great poise. We promised to send them tape reels from our OTR collection: 77 episodes of the 1932 Tarzan radio serial they had starred in -- and they showed their appreciation by sending us a huge box of ERB, Inc. books and dust jackets. Joan went through an ordeal in 1970 when she was diagnosed with breast cancer and had to undergo a mastectomy, followed by a year of cobalt treatments. 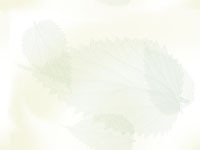 She never recovered the full use of her left upper arm and shoulder due to the removal of the muscles in that area. She survived this ordeal with a strength and optimism typical of the Burroughs family. While Joan was in recovery Jim experienced a massive coronary. 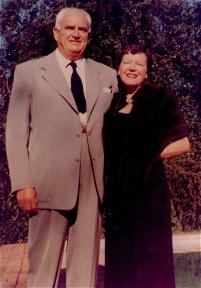 Since his retirement a combination of too little activity, too much snacking and his enjoyment of Joan's lavish meals shot his weight up to 258 pounds and clogged his arteries with cholesterol. During his recovery, the towering 6' 4 former Tarzan trimmed his weight down to 218 pounds through dieting and exercise. The family rallied together during these trying times and Mike was even able to fly home from Viet Nam. After these serious setbacks they realized just how fragile life is and the couple were starting to plan a leisurely trip around the world when tragedy struck again. 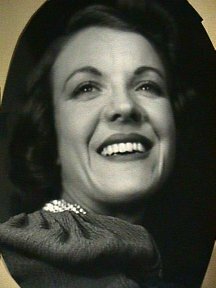 Joan suffered a heart attack at her home and died a day later in St. Mary Hospital on New Year's Eve 1972. Her last words to her husband of 44 years were, "I'll see you in the morning, sweetheart." 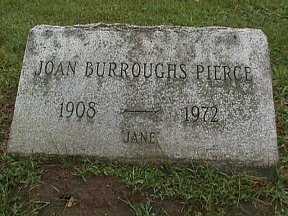 Joan's ashes were sent to Shelbyville Forest Hill Cemetery where Jim's dad had made two side-by-side headstones to be placed next to his own in the Pierce family plot. He had them engraved, "Tarzan" and "Jane." 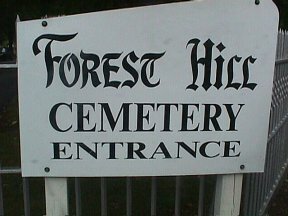 Jim was so distraught that his doctor suggested he not go to the burial ceremony, but finally allowed him to go after issuing a supply of tranquilizers and sleeping pills. The burial was made even more stressful by the apparent loss in transit of the burial urn containing Joan's ashes. The urn finally arrived in Shelbyville two days late, as it had been sent to Shelbyville, Illinois by mistake. Jim, alone at the graveside ceremony, but for his sister and her husband, placed a dozen red roses -- Joan's favourite flower -- on the grave. He confessed many times in his last years alone that Joan was the main driving force behind everything he did. In his autobiography -- The Battle of Hollywood by the Oldest Living Tarzan -- he says, "One thing I want to stress is that Joan is really the main character in this story. Without her and her great love, I could have gone down the drain. . . . Joan was always there to bolster my morale. I have had a good life, on the whole. 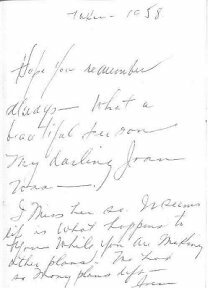 I don't think anybody ever gets through it without a lot of problems and crises, but I would do it all over again if only to have Joan's love, respect, and companionship for forty-four years. . . . I've been to all the fires, so to speak, and Joan was right alongside me -- we did it all! . . . That was worth going through all the trials and tribulations a million times over. No one can ever enter my life to take her place. It would be sacrilegious -- I loved her so."